BRISTOL - State champion hopeful Bristol Eastern had just watched its streak of 51 consecutive dual wrestling meet wins end in a loss to Simsbury on Saturday and was not about to watch another streak of theirs end Wednesday night, especially not against city rival Bristol Central. 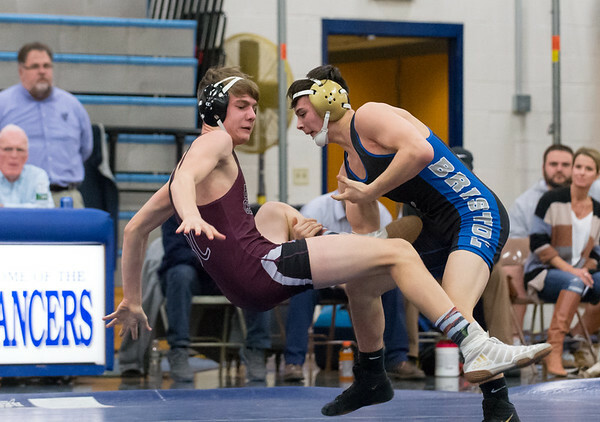 The Lancers left no doubt in a 64-3 drubbing of the Rams on Senior Night at Bristol Eastern High School, as the Lancers recorded three pins and two technical falls in the first seven matches to pull away early from Central, claiming all but the final match of the evening. The win marks the ninth straight for Eastern against its crosstown foe. Jake Aldi recorded the only points of the night for the Rams, earning a close 2-1 decision over Mason Lishness to break the scoreless streak, one of multiple matches that were close at points, but the scoreboard showed a convincing win for Eastern. The Lancers had dropped from second to third in the state poll after Saturday’s loss, but showed their overwhelming power against an 18-6 Central squad hungry for an upset and a share of the conference title. Instead of an upset, Eastern showed its championship-level caliber behind names like two-time defending Class L champ Justin Marshall, who recorded a dominating technical fall after Alex Marshall secured a second period pin in the previous match. Eastern’s Riley McCarthy used a reversal early in the final period to secure a 4-1 decision over Central’s Adam Ward and put the Lancers on the board first. Carson Sassu (126) recorded the first pin of the night after taking the lead on the scoreboard with a late takedown in the second period, then finished the job with a pin of Karriem Hoe before the second period buzzer. Trying to record the team’s first points of the night, the Rams’ Jason Feto threatened a comeback with a takedown of Eastern’s Gabe Soucy in the third period to pull within one point, but Soucy responded immediately with a takedown of his own and pulled away in the closing seconds to stretch the Lancers’ lead to 17-0. The Lancers continued to widen its lead with three pins in the next five matches, including one from Dylan Garcia, who made quick work of Jacob Boucher by recording the pin in 46 seconds to give Eastern a 43-0 advantage. Much more drama ensued in the following match, as Eastern’s Ethan Mathieu and Central’s Jakob Salinas battled into the final seconds of the third period, tied at one point apiece. Mathieu recorded a takedown with less than 20 seconds left, but Salinas followed with an immediate escape to cut Mathieu’s lead to 3-2. Mathieu held on for the close decision. The Lancers temporarily resumed their all-out dominance in the next match, when Trinidad Gonzalez pinned Alex Roy in seven seconds, until Aldi rescued Central from a shutout three matches later. Posted in The Bristol Press, Bristol Central, Bristol Eastern on Wednesday, 6 February 2019 21:58. Updated: Thursday, 7 February 2019 10:45.